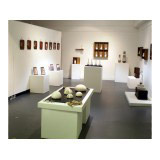 The Gallery Pieces are unique Sculptures, each one a progression from the last, with an emphasis on aesthetic vision, simplicity of form, line and decoration. They are coil built using flattened coils with slabs incorporated to create the carved/inverted shadow forming sections. Textures are added both during and after the building process to give an organic element in contrast to the architectural forms. Inspiration comes from an appreciation of form, observing the intricate shapes in the natural environment, as well as the line and shadow observed in architecture. The carved features are included to create a harmony between shadow, line, form and texture. Essentially an investigation into the light and shadow that form creates and reveals. Proportion and Balance are other areas of concern during the making process; pieces often appear as if they should fall over, when in fact they are perfectly balanced.